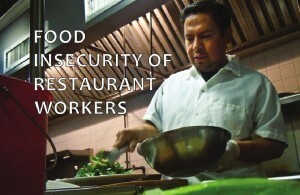 Today, ROC-NY along with USFSA members Food Chain Workers Alliance and Food First released a new report, Food Insecurity of Restaurant Workers, a first comprehensive look at food security and employment conditions of workers in the restaurant industry. The report, based on over 280 surveys and interviews with restaurant workers in New York City and the San Francisco Bay Area, highlights the crucial ways in which restaurant workers’ employment conditions affect their ability to feed themselves. Tipped workers in NYC were 30% more likely to be food insecure than their non-tipped counterparts. While NY’s minimum wage is set to rise to $9 by 2016, tipped workers in New York earn a sub-minimum wage of just $5 per hour. NY Governor Cuomo has the ability to raise tipped workers’ base pay administratively through a Department of Labor Wage Board. Citing high rates of food insecurity among tipped restaurant workers, ROC-NY, FCWA, and allies are calling for an elimination of the sub-minimum wage through the Wage Board process. The full report is available HERE, and a NY-specific supplement that includes information about NY’s tipped workers is available HERE. This entry was posted in Labor & Trade. Bookmark the permalink.